It’s a lay down misere that the incumbent coalition will resort to scare campaigns in the run up to the next election. They have already commenced doing so and serious campaigning is underway. The scare campaigns will probably revolve around immigration (Stop the Boats) averting an economic catastrophe and the threat of terrorism. With immigration there is not much difference between the policies of the main parties with that of Labor’s being slightly more humane. With regards economic management the recent record of Labor in handling the GFC earned it praise around the world. 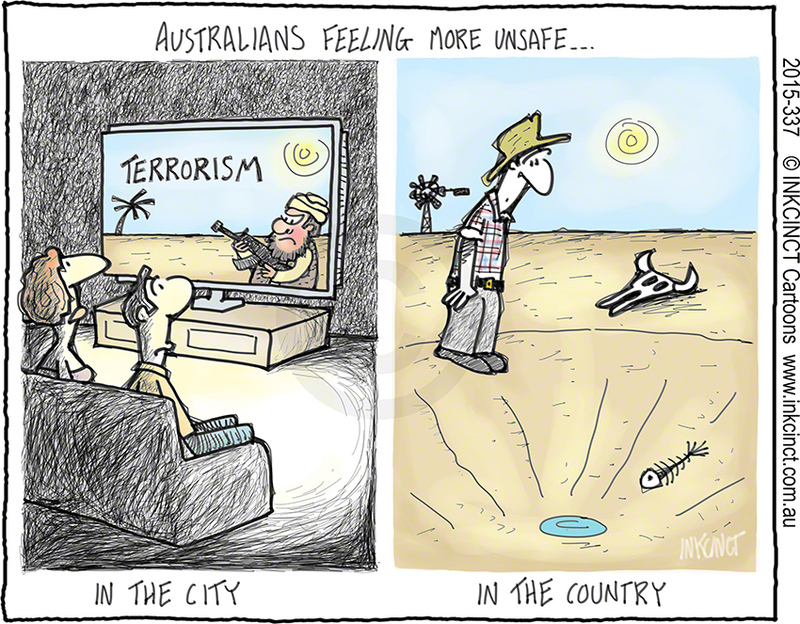 But with the terrorism threat the scare campaign is an obvious distortion of the truth. The number of people killed by political terrorism in Australia over the last one hundred years can be counted on your fingers. As a comparison Melbourne climate commentator Dr Gideon Polya noted “Presently about 80,000 Australians die… each year in Australia from “life-style” and “political choice” causes (e.g. 15,500 pa from smoking, 10,000 pa from air pollution, 500 pa from heat stress) as compared to 0.2 pa from jihadi terrorism this century.” You have more chance of dying falling out of bed. Also of note is the 500 fatalities per annum due to heat stress – an extreme weather event heavily influenced by global warming. How many Gippsland fatalities have been caused by global warming? Whilst being unable to quantify this we can safely conclude that the deaths resulting from climate change this century in Gippsland alone far outnumber those that have resulted from terrorism across Australia ever. The climate influenced fatalities of the heatwave preceding Black Saturday and the bushfires are probably greater than the terrorism total on their own. Obviously the real scare campaign should be about global warming which our governments for the last 6 years have denied, dismissed or ignored. They continue to do so with the aid of an extremely shallow and biased main stream media. Hopefully people will see through these fraudulent campaigns – the sooner the better. We must make this election the first of many climate elections. I first learnt of the importance of the bogong moth in Alpine Aboriginal society in 1973. As my studies were primarily on frontier conflict I did not write anything further on this until about 1990. In one of the essays I republished in a little booklet entitled Notes on Victorian Alpine Aborigines (1997) I wrote the following. There can be no doubt that the bogong moth* was a very important food item in all the Aboriginal groups with access to the high country including four of the Kurnai tribes. 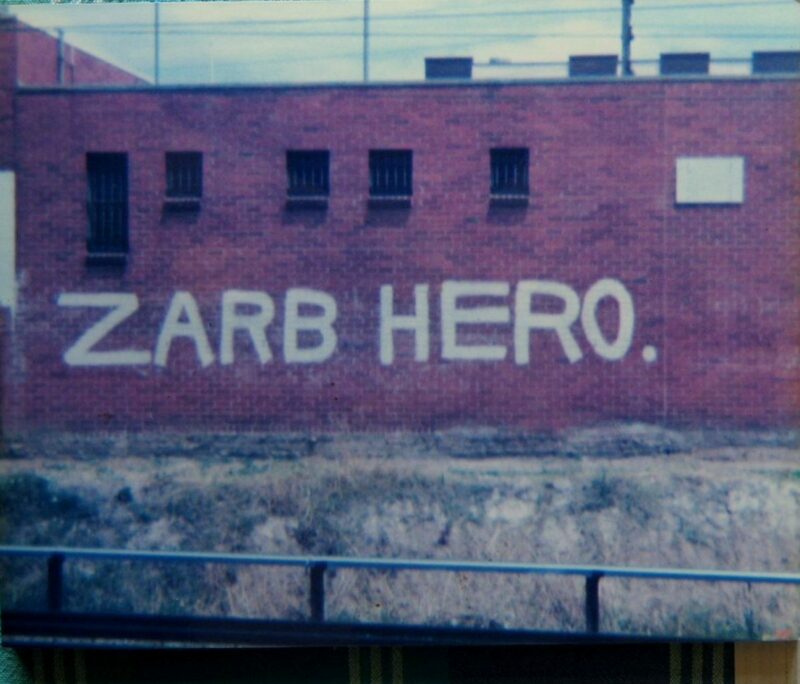 But beyond the historical Koori connection I had done no further work until the recent reports in the main stream media of the catastrophic collapse of their population (see here and here) the articles of which I summarised here. The moth has obviously survived for millennia including bad droughts. But the droughts are now longer, harsher and more frequent as the planet warms. As well science is yet to establish when warming first commenced in our region as a result of the enhanced Greenhouse effect**. Perhaps the 1898 fires in south Gippsland and the Federation drought were early local events influenced by global warming? On top of this the breeding grounds of the moth have seen a massive expansion of cropping and many larvae must fall victim to chemical sprays. 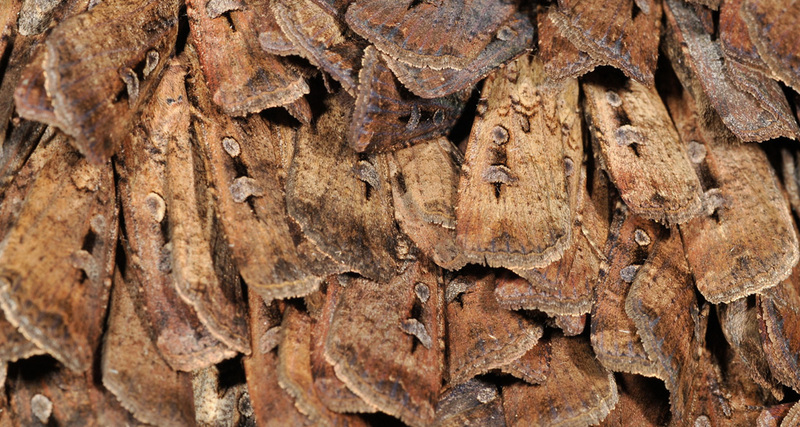 Time will only tell whether the bogong moth numbers will recover but as many animals and insects are now struggling with one degree of warming how they will cope with a further degree or more is foreboding. *see Flood, J. 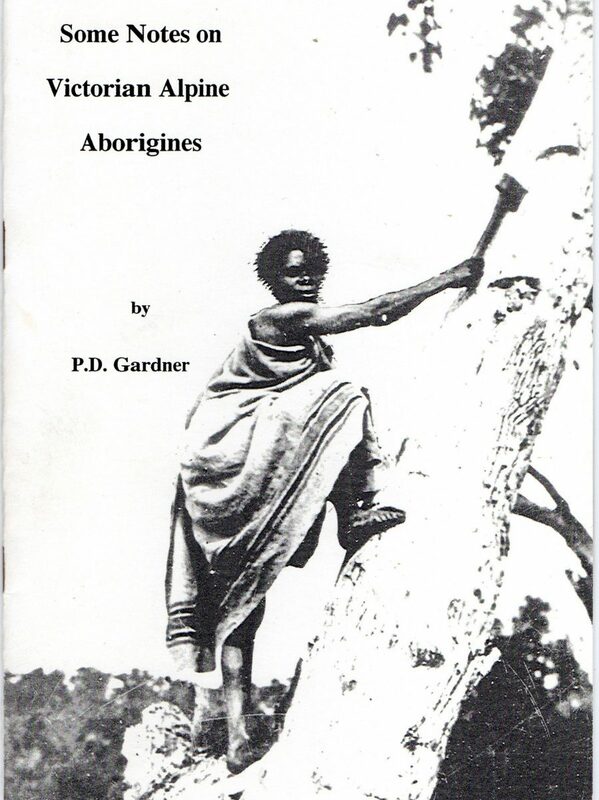 The Moth Hunters of the Australian Capital Territory (1996) pp.12-17 for more detail. **Joelle Gergis in a Sunburnt Country revealed human induced warming in the northern hemisphere commenced as early as the 1830s (p.167). The news is just in from the Bureau of Meteorology (BOM) that Australia has just experienced its hottest summer since records began (see here and here). Not only were the records beaten they were ‘smashed’ by 2 degrees above the long term average. It comes as no surprise, as the BOM map indicates, that all of Gippsland (except for the far south west around Grant and Wonthaggi) experienced a record breaking summer. Also Australia wide rainfall was 30% below average “making it the driest summer since 1982-83, a season affected by a strong El Nino event.” The summer rainfall map for Gippsland is more complicated with a most of the region experiencing a rainfall deficiency with an area in south Gippsland and the Latrobe Valley experiencing a ‘severe deficiency’. Only in the far-east, Cann River to Mallacoota, was average summer rainfall received. It must be remembered that this is for summer rainfall only and consequently most of the region remains in drought. I have commented on this recently here. The current bushfires across Gippsland from Bunyip to Dargo and in the Strzeleckis near Yinnar combined with the early autumn low intensity heatwave felt across most of the region are indicative of how dry it is. But I have yet to see a media article that mentions the planet warming or the words ‘climate change’ in association with either the fires, the unusual warmth or the dry. Like the ‘Timbarra’ these bushfires will continue to burn for some time and may await substantial rain to put them out completely. It is of more than passing interest that the region has experienced bushfires across the last four seasons – from the winter bushfire at Cape Conran to those currently burning. And unfortunately the autumn outlet is not looking promising. 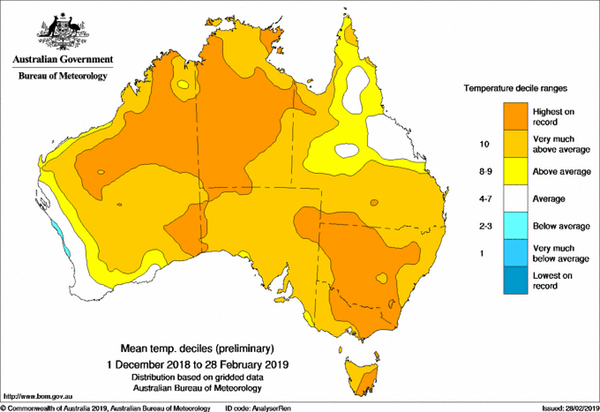 We have entered the season with low intensity heatwave temperatures and the BOM predictions for the eastern half of the continent are for a below average rainfall in autumn. For Gippsland the predicted chances of exceeding ‘median’ rainfall are low – in the 25-30% range. Action to combat global warming poses a dilemma for whatever we do now is not going to solve anything in the short term. But by doing nothing or making tokenistic efforts, or worse still fiddling our carbon accounts, we can be sure that it will get worse and worse and worse – hotter and dryer with the occasional catastrophic bushfire or drought breaking flood thrown in. That we are in a climate emergency has been apparent for some time. Bogong Moth another victim of climate change? “The moths find caves and cracks in boulders to hide away in a torpor state. A cave at Mount Gingera, near Canberra, has been known to house millions of the moths but last month Green and colleagues counted just three individuals. Searches of about 50 known sites have turned up similar catastrophic absences. They haven’t just declined. They’ve gone…” The article also emphasised the impact that this was having on the endangered Mountain Pygmy Possum – heavily dependent on the moth as a food source. Of some interest is a review I recently posted of Barbara Kingsolver’s novel Flight Behavior – an account of how the changing climate messed up the aestivation and migration of the monarch butterfly. Now it appears as though some of the bizarre fictional accounts are being realised in our own backyard, with the bogong moth a species with a similar life cycle to the monarch. Like the recent dreadful mortalities amongst Bairnsdale’s flying-fox colony, the plight of the bogong moth is another wake-up call – another ‘canary in the coal mine’ – that tells us urgent action is required on climate change now. I hope to do a follow up post on this in the next few weeks. Organiser of the event Ro Gooch stated: “The aim of the meeting is to help inform people and to discuss ways we can help both locally and globally.” Ro heard Jane recently speak at the Sustainability Festival and invited her to speak in Bairnsdale. Hopefully the audience will include local councillors and representatives of the media, as well as a cross-section of the general public. A full report will follow the meeting. Australia could soon be home to the world’s largest offshore wind farm, with the 2GW Star of the South proposed off Victoria’s Gippsland coast in June 2017. But more than 18 months later, the federal Coalition government remains quiet about the proposal despite receiving departmental recommendations, as revealed in Senate estimates yesterday. Answering questions from ALP Senator Anthony Chisholm in Senate estimates during the final sitting days of Parliament, the Department of Environment and Energy revealed it has made a recommendation to the Energy Minister as part of a briefing about the project. The decision now rests with Federal Energy Minister Angus Taylor. 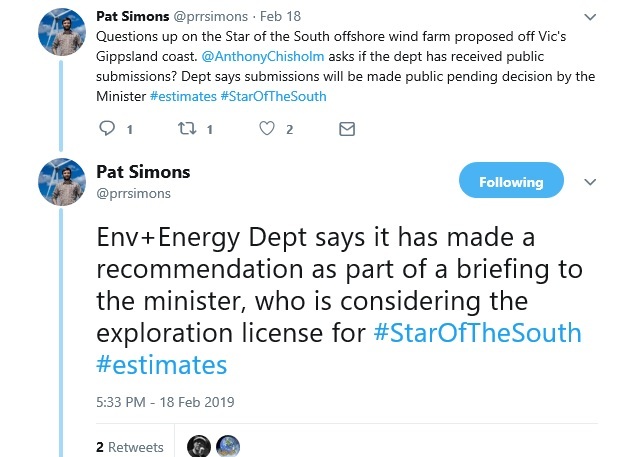 In order to proceed to the first stage of detailed planning processes to properly assess wind resource and any possible environmental impacts, the project requires an exploration license from the federal government. The obvious question is why the delay? If it goes ahead the Star of the South offshore wind farm could create as many as 2,000 direct jobs and 10,000 indirect jobs, and avoid up to 10.5 million tonnes of greenhouse gas emissions in the electricity sector every year. The prospect of powering as much as 20% of Victoria with clean energy shows that Star of the South could be a game changer for action on climate change. Not only that, at a time when the federal Coalition insists it is squarely focused on reducing power prices, it is bizarre that the Morrison government appears to be delaying a landmark renewable energy project that would bring on new electricity supply. 3. Clarify his position on the role of wind energy technology in Australia’s electricity grid as part of action on climate change. Climate Independent candidates for the approaching federal election are coming ‘out of the woodwork’ on a regular basis now. Some very high profile candidates – Zali Steggall in Warringah, Oliver Yates in Kooyong – are already campaigning strongly and getting publicity in the main stream media. There are also some climate independents with a high local profile getting onto the bandwagon. I believe that there are two climate candidates in the seat of Mallee. 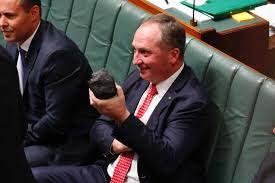 We await further climate independents – preferably high profile – to appear in the seats of climate change deniers Joyce (New England) Kelly (Hughes) and Andrews (Menzies). Having a large number of climate independents is a great first step. On its own it will help push the election towards a referendum on climate change. It is of note that some candidates are far more ‘progressive’ on the climate solutions than Labor. Steggalls for instance wants Labor to drop any support for Adani. 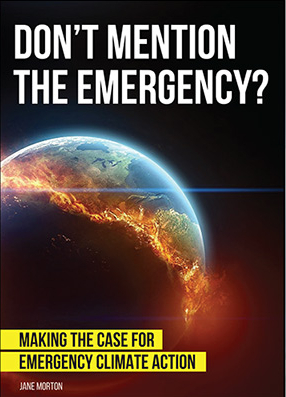 Many of these candidates accept that there is a climate emergency. Their high profile and public support means the media – even News Corp – are obliged to give them some coverage. This will also give momentum to the climate referendum. Voting strategically is not new to Australians. They have been doing it for many years with first the Democrats and then more recently with the Greens. This has mainly involved switching votes from one party to another between the lower and upper houses. Only occasionally it has helped elect an independent in the lower house. And in these instances it has almost always involved splitting the conservative vote as in the case of Kerryn Phelps and the recent Wentworth by-election. For the climate independent to succeed two critical factors are involved – reducing the incumbent’s primary vote to 45% or below and garnering enough primary votes to come second in the contest. This will involve ‘strategic’ voting by Labor and Greens supporters who, for a number of reasons, may cast their primary vote for the climate independent. The remainder – ‘rusted on’ voters of these parties – must direct their preferences away from the incumbent to the climate independent. I don’t hold out much hope for this in Gippsland but it would be nice for climate independents to step up in the Gippsland and Monash electorates to help focus our region on the real issues that confront us. On a national scale the election of one or more climate independents and the removal of some of the climate dinosaurs will be a big step towards a common sense approach towards the climate emergency. Environment group FOE has criticized the Environment Protection Authority’s (EPA) decision to approve a trial brown coal to hydrogen project in Latrobe Valley* on the 14th of February as a costly distraction from action on climate change. The project is led by the multinational corporation Kawasaki Heavy Industries. It involves building a test plant to extract hydrogen from brown coal from the Loy Yang to be exported to Japan. This trial project requires the dredging of Westernport to enable the export of the hydrogen from the Port of Hastings, and the injecting of carbon-waste into the seabed off Ninety Mile Beach using unproven and risky technology. “Kawaski’s brown coal project is yet another clean coal pipe-dream, a false-promise to the Latrobe Valley community and an expensive distraction in a time when we need urgent action on climate change,” FOE coal spokesperson Kate Wattchow said. The Federal Government has committed $50 million in public funding to Kawasaki’s trail project, in addition to $100 million towards CarbonNet, who are leading the proposed carbon-waste injection project. “This project is entirely dependent on the successful injection and long term storage of carbon waste into the Ninety Mile Beach seabed, yet despite billions of dollars of investment in this technology it has failed to become viable in Australia,” campaigns coordinator Cam Walker from FOE said. 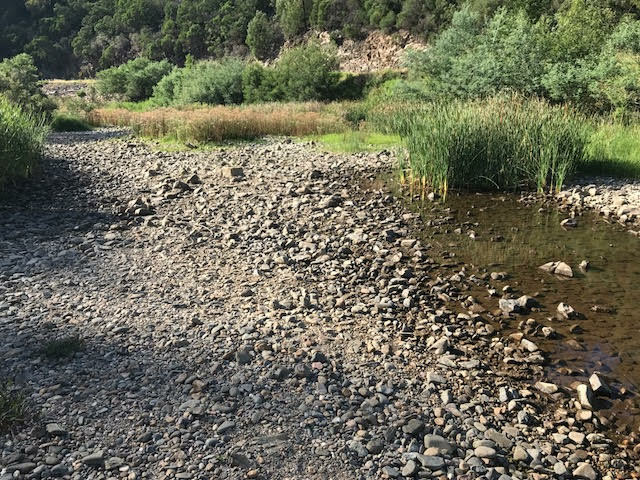 “The fact that the EPA has approved this project reveals a significant flaw in the approval process, as well as a disregard of the viability of the technologies involved and the impacts on the community of even a trial project,” Kate Wattchow said. 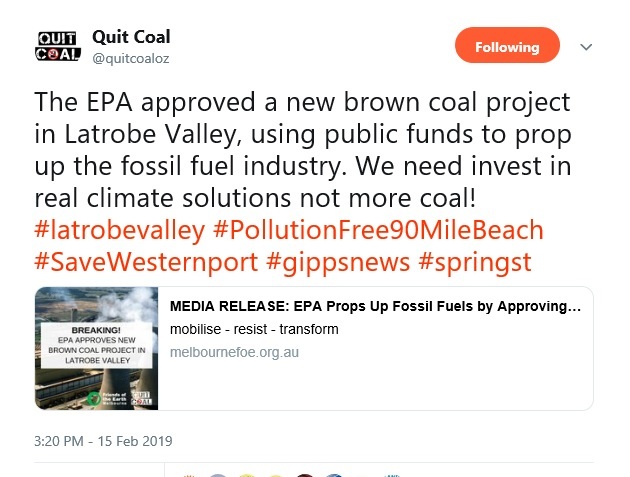 The coal to hydrogen trial plant in Latrobe Valley, the connected port expansions in Westernport, and the carbon-waste trial project on Ninety Mile Beach, are all opposed by local community groups. Opposition is broad ranging, though all groups share common themes of opposition based on the impacts on human health and the local environment, the need to act on climate change, and the wasteful spending of public funds. The full MR is here. *I have blogged on this several times. See here and here. Despite some good showers in Bairnsdale over summer the East Gippsland dry continues. How far it extends into central and south Gippsland I am not aware and without ploughing through the rainfall records I can only assume that it is still fairly dire across Gippsland but with a green flush in many places from the latest rain. The large bushfires that have burned at Rosedale, Walhalla and Timbarra over the last month indicate that the dry is still widespread across our region although they, too, have been subdued by the recent storms. Another indicator of the dry may be water for irrigation. The Southern Rural Water website states “When river, creek and groundwater levels drop, Southern Rural Water often has to introduce rosters, restrictions or bans to ensure a fair distribution of available water to all licence holders.” I have been informed that irrigation on the Mitchell River may be “about to be banned” and that it is currently at Stage 9 – one step before a total ban. Other anecdotal accounts abound. Some farmers in the Swifts Creek district have been feeding out for 2 years although they have had some good summer rain. Lake Bunga at Lakes Entrance is almost as low as it can be without bursting out into the ocean and draining completely. The latter has only occurred 3 times in the last 30 years after periods of very heavy rainfall. It is also very salty indicating substantial water loss through evaporation. This illustrates part of the problem of summer rainfall – that much more moisture is lost to evaporation and thus greater rainfall is required to make an impression on soil moisture. The rainfall is also often via storms which can result in heavy falls in some areas but varies substantially from place to place. Some time ago I was informed that parts of Glenaladale had missed most of the summer rains although hopefully they got some in the last dump. Climate change predictions have been clear for many years; that the droughts we experience will be longer and more severe, and that they will often be broken by short periods of heavy rainfall causing floods. Such was the lot of the Omeo district in 1998. And if we need a reminder of what a grand disaster of this sort is like look to western Queensland now.